Very few people in the world have the priviledge of spending time with their grandparents. I have never seen my grandfather but have seen him through the eyes of my grandmother whose talks reflect him and how she misses him. My grandfather died almost 30-35 years ago and I can just understand the pain my grandmother might have taken without him. I adore my grandmother a lot. She is no doubt smarter than anyone of her 90+ age. Everytime I visit her I learn something new. A new angle to one of her stories. A new approach of telling things. Her memories, her pain, her happiness.. The stories never fall short. Time may run out but not the endless tales of her life. Its just amazing that she remembers so much so well. I visit my grandmother every Sunday who lives with my uncle and his family. She waits for me and I wait for the day to visit her. I am glad that I am having this special bond with her. I am amazed every time with her sharp memory. She knows if I was early or late for the visit compared to last Sunday’s visit..She notices if I had come walking or on my bike. She notices what color are my clothes. She doesn’t like black and asks me to avoid it. She notices if I have shaved or not or if I have put on weight since last week. She knows everything and all this at her 90+ age! I am blessed. I wish I could stay with her for more.. I wish I could take care of her more.. Even with her 90+ age, she can write well. She knows many English words of daily use. She says ‘Fijja’ for Pizza and ‘Lijer’ for Geyser. But she knows how to communicate and does that well indeed. She understands everything right on the first explanation itself, there is no need to explain again. She remembers all her medicines and when they would be finished. Everything is well planned. Her thoughts are surprisingly modern, Even than my mother. Completely un-conservative. 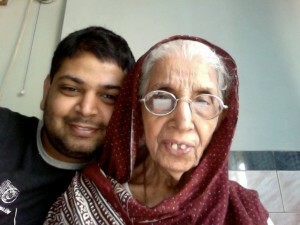 A very strong lady who has seen ups and downs of life from all angles throughout her life. Many a times she expresses grief of how the world treated her in the past. Of how ungrateful people have been to her. But she is never angry or discontent now, In fact all she wants now is a peaceful and satisfying death. A much noble want than most of our worldly desires. With such modern thoughts, I have never met anyone else who would be so religious. She remembers almost 1/10 of the Holy Quran in her mind and her speed for recital can give a clergy an inferiority complex. Every 10 days she finishes reciting the whole Quran. Some people cannot finish this over a month even! The only grief she has is that from last two years she has not been able to keep her month long Ramadan fasts due to her health. She would have still kept the fasts even with her old age and health problems if the elders of the family had not refused ! This entry was posted in All Blog Category on September 8, 2010 by Hussain Fakhruddin.